Skiing and snowboarding in Vermont are experiences that can’t be beat – but they can be improved. Green Mountain State ski areas have had their noses to the grindstone this off-season, revamping everything from their facilities, terrain and ticket/pass options to off-slope activities and amenities. Bolton Valley: Bolton Valley is thrilled to bring back, in modern form, the ski team heritage which has been a part of the resort since its beginning. Whether team members will go on to skiing fame like several of the DesLauriers, go on to racing success, or are simply in it for the excitement of the sport, the goal is to create a lifelong love of skiing & riding. Programs will help athletes from ages 3-18 develop skills over a season of skiing or riding with dedicated coaches. There are programs for all ability levels from beginners to rippers who want to take their skiing or riding to the next level. Bromley Mountain: Bromley has announced a new partnership with Arena Snowparks. They’ll collaborate to create a family-friendly progression park for all skill levels, green to black, with all new features and a wicked mid-season rebuild. Bromely didn’t stop at upgrading its park; the resort also improved its off-slope experience by expanding its events calendar, plus made some minor renovations and adjustments to the Wild Boar Tavern (located at the base of the mountain), to create a more fun, comfortable and aesthetically pleasing atmosphere for everyone. Jay Peak Resort: Jay Peak is continuing to evolve away from being a destination that solely relies on snow for its economic health with the construction of two synthetic-turf athletic fields. The FIFA-sized pitches will be used to host soccer, lacrosse, field hockey, and ultimate Frisbee tournaments. Jay looks to expand on the success it realized in the youth-sports market with the opening of its Ice Haus in 2010, an NHL-sized skating arena that currently hosts 42 weeks of 10-18 team hockey tournaments. 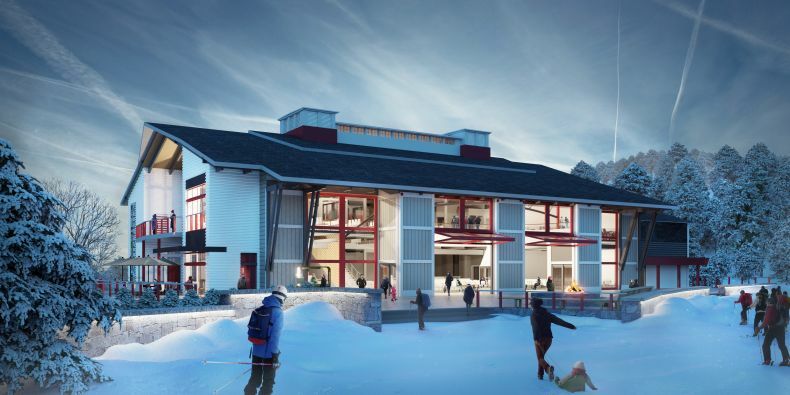 Killington Resort: New investments totaling $25 million will revolutionize year-round guest experience at Killington. Enhancements will include a new 6-person high speed bubble chairlift, new lift service at South Ridge, significant upgrades to the K-1 Express Gondola, additional availability of intermediate trails, improvements to existing intermediate runs, and resort-wide infrastructure upgrades including the addition of hands-free lift access validation with RFID technology at both Killington and Pico. Mad River Glen: Mad River Glen’s goal is to maintain and preserve the experience rather than overhaul or upgrade it. The ability of Mad River Glen to consistently reinvest in the mountain’s infrastructure is a testament to the success of the Cooperative. Both the skier-owners and the management understand that skiers come to Mad River for the unique combination of legendary terrain, sense of community, low skier density and intimate atmosphere. In more than 20 years of co-op ownership, Mad River Glen has invested more than $5M in capital improvements. Magic Mountain: The new ownership at Magic continues its capital investment in Vermont’s throwback ski area. After winning Liftopia’s award for best ski area in North America for the second year in a row, Ski Magic LLC continues to invest in its counter-cultural ski and ride experience. Off-season projects include installing a new base-to- mid mountain double chair (the “Green Lift”) which helps broaden the accessibility of Magic’s classic terrain to young families with novice and intermediate level skiers. In combination with more snowmaking, this new lift should allow Magic to open far earlier in the season—think Thanksgiving—if cold weather cooperates. In addition, Magic has purchased a fixed-grip Quad lift from Stratton which will significantly increase uphill capacity for years to come once it gets Vermont state permitting approval by the 2019/20 season. Also, this fall, Magic will be increasing its access to more water for more snowmaking coverage with a new pump house for withdrawal from the nearby Thompsonburg Brook. 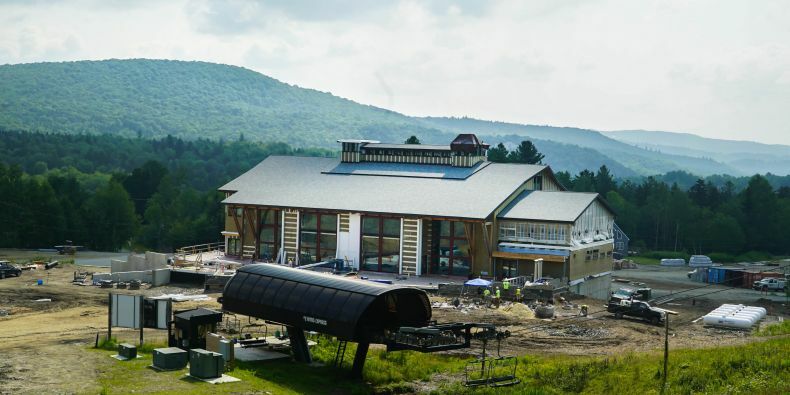 Mount Snow: Mount Snow is now putting the finishing touches on its brand new $22M Carinthia Base Lodge. This new base lodge, which will open at the start of the 2018/2019 season, is conveniently located right at the base of Carinthia Terrain Park. 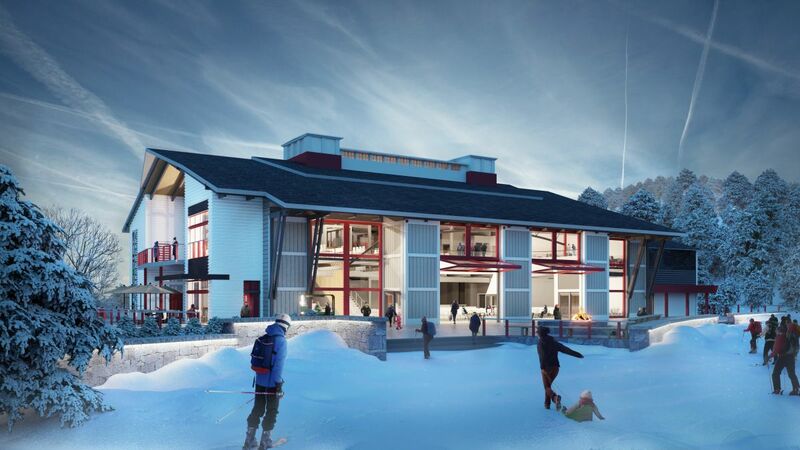 This new 42,000sq/ft lodge is five times the size of the old lodge it is replacing, and will feature everything a skier would want, including a coffee bar, sit-down restaurant, two bars, and a large multi-station cafeteria; along with retail, rentals, ski school, ski patrol, and more. 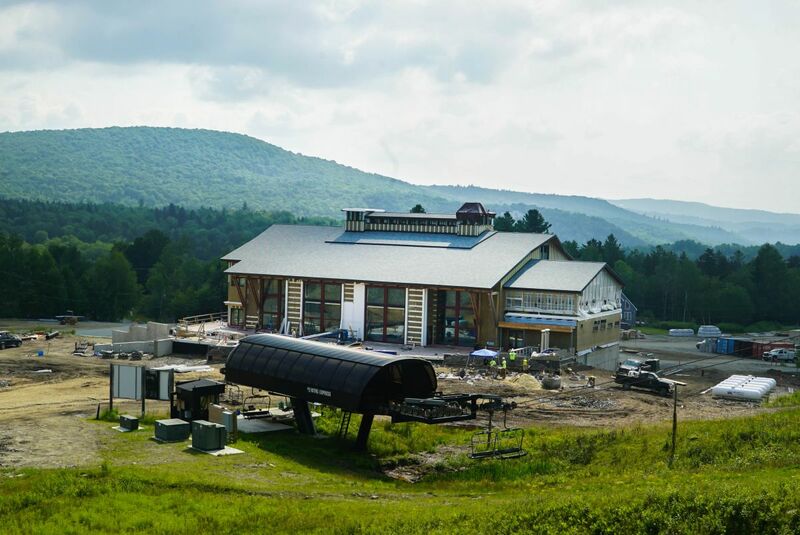 The lodge’s opening will help mark Carinthia’s 10-year anniversary of becoming a 100-acre all-terrain-park mountain face. Okemo Mountain Resort: Okemo is now an Epic resort. On June 4, 2018, Vail Resorts, Inc. announced that it had entered into an agreement to purchase Triple Peaks, LLC, the parent company of Okemo Mountain Resort in Vermont, Mount Sunapee Resort in New Hampshire, and Crested Butte Mountain Resort in Colorado. The announcement also included, as part of a separate transaction, the purchase of Stevens Pass, in Washington. Vail Resorts plans to invest $35 million, over the next two years, across the four resorts to continue to elevate the guest experience. The 2018-19 Epic Pass, Epic Local Pass, Epic Australia Pass, and Epic Military Pass include unlimited and unrestricted access to all three resorts, with seven and four unrestricted days for the Epic 7 Day and Epic 4 Day passes, respectively. Vail Resorts will continue to honor previously sold 2018-19 season pass products for Okemo. Smugglers’ Notch: Smuggs’ continues to grow the scale in which it appeals to families with the resort’s free Kids’ Club. Unrolled last Winter as a test run, the Club offers all kids 12 and under a free “treasure chest” of goodies. The weeks of 12/16-12/21, 1/13-1/18, 2/3-2/8, and 3/3-3/8, Smugglers’ will offer all guests staying on any Club Smugglers’ package free lessons and rentals for kids 12 and under. Smuggs’ banked slalom course on Madonna Mountain will open new doors for intermediates and experts both in and out of lessons. The banked slalom course will also host a series of events this upcoming Winter season. Fat Bikes give Winter access to Smuggs’ expansive cross-country MTB terrain. Rental bikes will be available, and Resort staff is working on planning bike-specific Winter events. Smugglers’ has also added a brand new Wintersteiger machine to expand types of tunes available to its guests. This machine offers far more options than the one currently in use and is more sensitive to the array of profiles now offered by ski companies. Stowe Mountain Resort: New this winter at Stowe is the creation of on-mountain ‘Kids Adventure Zones.’ These well signed areas will give kids & families the opportunity to easily access gentle side-country areas and freestyle terrain purpose built for learning progression. Also new this winter is Epic Mix at Stowe. This allows skiers and riders to track their days and vertical feet skied, earn digital pins, share photos, race against the pros and check real-time lift line wait time using their RFID chip-embedded season pass or lift ticket. Stratton Mountain Resort: Work is well underway on Stratton’s new Snow Bowl lift, the major project in this year’s $10 million-capital plan. The high-speed quad is positioned to minimize wind impact with lower towers and built with a parking rail for all 98 chairs to combat overnight icing. With a 1,000-foot-per-minute speed, ride time is reduced from 14 to five minutes. Plus, the top ramp will provide smoother access to Mike’s Way, a beginner run from the summit of southern-Vermont’s highest peak, and the old Poma-line trail will now be officially listed on the trail map, bringing the count to 99. Sugarbush Resort: This season, Sugarbush celebrates its 60th anniversary since Damon and Sara Gadd, along with their friend Jack Murphy, opened the resort in 1958. Sugarbush will be hosting anniversary celebrations throughout the year. Sugarbush has also joined the Ikon Pass, connecting some of the most iconic mountains in North America. The Ikon Pass or Ikon Base Pass provide 7 or 5 days of access to Sugarbush, respectively, along with more than 20 other destinations. On-mountain improvements this season include snowmaking upgrades, lift upgrades, and relocating the beginner First Time lift for more convenient access. Suicide Six Ski Area: This summer, Suicide Six is implemented trail improvements and created the Elemental Bike Park. For powder season the mountain biking trails will offer skiers and snowboarders hidden stash lines to discover. In addition, eight new tower fan guns, one of which produces massive amounts of snow on a 30-foot tower arm, and several new lance guns on the signature face trail, were purchased and installed. The classic and challenging FIS certified slalom trail will now be fully automated. There will also be improved snowmaking in the FUNdamentals area where instructors are well trained to teach new snow sliders.